Introducing your new A-Z Journal Lookup! ... which at this sample library their holdings include the journal History of Science (Sage) and this also matched the title The British Journal for the History of Science (Cambridge) as well as BrowZine's Category "History of Science, Technology, and Medicine" which leads to a number of different titles with content in that category but without the phrase "history of science" in the name. 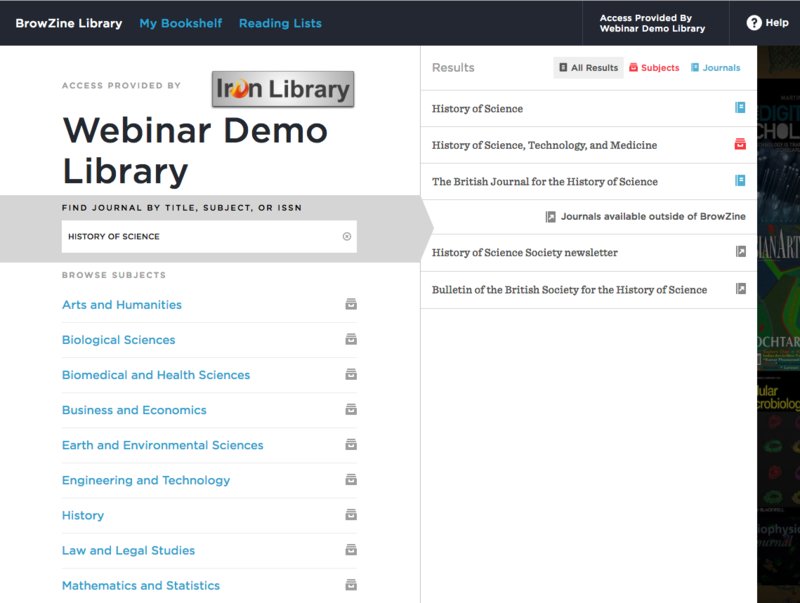 The two unsupported titles include a newsletter without scholarly articles and The Bulletin of the British Society for the History of Science which was last published in 1961. If you do select one of these titles outside of BrowZine, the user is automatically routed, via ISSN lookup*, to the library's knowledge base/link resolver so that the user can continue on their path to full text. Otherwise, selecting a journal or subject within BrowZine brings you to the tables of contents and then full text content quickly and easily. 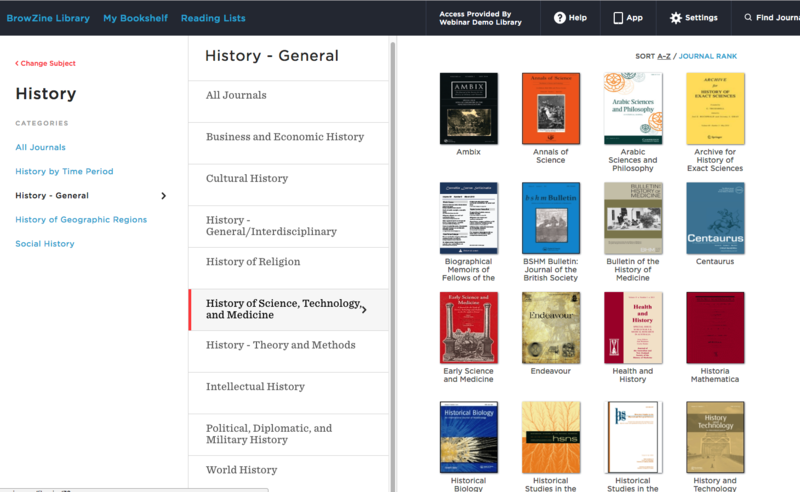 Providing the full listing of titles in a library's A-Z Journal lookup optimizes the entire journal engagement experience by ensuring that if a user is looking for a newspaper, for example, they find it quickly in BrowZine and do not have two search for it in two locations making BrowZine an excellent choice as the main gateway to your serials collection! This feature has been greatly requested by libraries and we are pleased to bring this to our subscribers who are utilizing BrowZine as their primary journal A-Z interface. As the feature does require some data processing to start the service, we will be rolling this out to customers throughout 2016. At this time, this feature is only available for the web version of BrowZine and the external results are not visible on the mobile app versions of BrowZine. If you have any further questions about this enhancement, please contact us at support@thirdiron.com. * = While ISSN look is preferable for its specificity, some Primo and OCLC customers may not have the ability to search their knowledge base by ISSN and thus a workaround to search by journal title is performed.